You may have noticed we're fans of using practical models as tools to support marketing strategy development. We believe a clear, simple model gives us a framework to assess how we're doing things now compared to our competitors and plan growth strategies for the future. They're also great for communicating the purpose and reason behind a strategy you are pursuing. 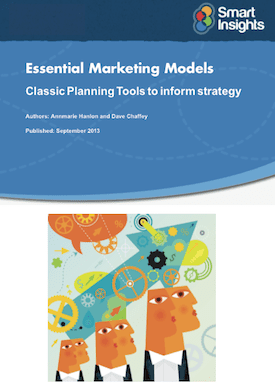 Download our Essential Marketing Planning Models guide. 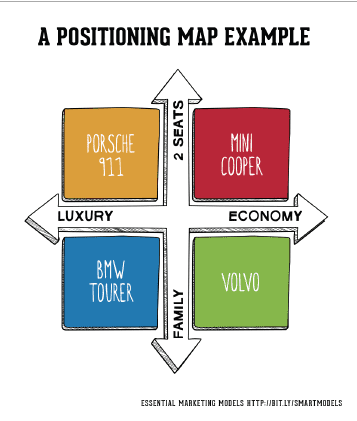 Which are the most popular marketing models? In the Essential Models guide we have selected what we see as the classic,most popular models that have stood the test of time and we think are still relevant in today’s era of omnichannel marketing. But which are the most useful - do take our poll to share which you think are of the most practical use and are valuable in understanding opportunities to grow a business. Please select which you find most useful of the 15 models covered in our guide - you can select more than one or suggest others. When you answer you will see the overall results. If you can't see the poll to vote - please visit the poll directly here. We would also like to hear what you think about the relevance of these model in 2016. Have they had their day, do you find them useful, do you have better alternatives? Please tell us what you think in the comments below. Some marketing models are digital-focused while others apply equally to digital and traditional forms of communication. For example, our own RACE model is designed specifically for digital marketing. Because of this, we've just produced a new guide free for all members on digital marketing models specifically. It gives details on the 10 key digital marketing models, so you get the most relevant marketing models for your business. This new guide, published in 2016 lists 10 models that can be used by marketing professionals and students for digital audits, planning and strategy. Since I'm a digital marketer, I have my own views on the relevance of these, indeed in my books I have often included them. In fact, most are included in my Digital Marketing: Strategy, Implementation and Practice book. So before we wrote the guide I thought it would be nice to share an overview of the relevant models here for anyone passing this way who isn't familiar with them. A more detailed explanation is available in the free guide! The 7P's of the Marketing mix model are Product, Price, Place, Promotion, People, Process and Physical evidence - these elements of the marketing mix form the core tactical components of a marketing plan. I think it's right this is at the start of the list since it's still widely used and I think is a simple way to think through how a company markets its products. A good model to explain marketing strategy to someone who isn't a marketer. But it suffers from a push mentality completely out-of-keeping with modern digital marketing approaches of listening to and engaging customers in participation through social median marketing. This is a simple concept and an essential message to communicate online since the core brand message often isn't clear. Here are some examples of websites that communicate their online value proposition well. It's not really a model, so although it was included in the CIM centenary vote it's not included in our guide. This well known, essential MBA model categorises products offered by a business in a portfolio based on their performance rating them as Stars, Cash Cows, Dogs and Question Marks as below. I find this isn't so applicable in the online marketing world for small and medium businesses - it's more of a Big Business corporate strategy model. 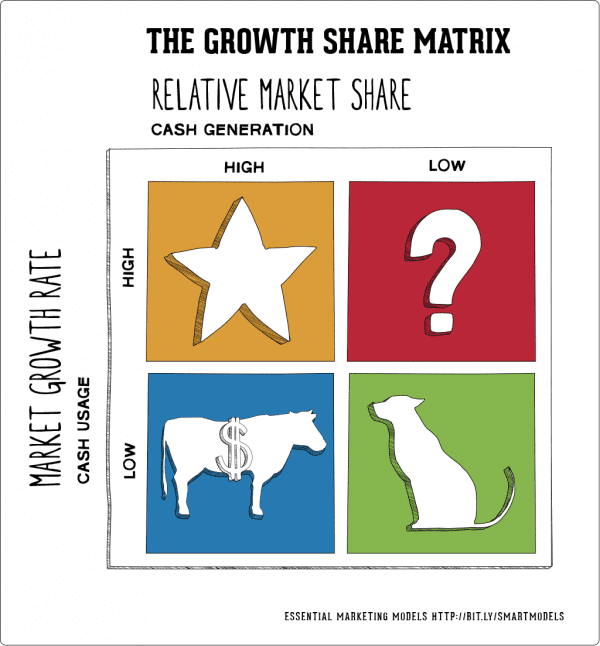 See Annmarie's post on the BCG Matrix model for more details. This model allows marketers to visualise a brand’s relative position to competitors in the market place by plotting consumer perceptions of the brand and competitor brands against the attributes that drive purchase. This is a great concept for understanding how customers see a brand. We've included an example in the guide. I can't recall many descriptions of this being applied online. I have seen it used as part of user-testing though in comparing different websites? The creation of an engaging online brand is so important to success in digital marketing, it's a pity there aren't more effective branding models. A different class of models to others, this is more of calculation model - covered in Chapter 6 of my Internet Marketing Book. CLV is mainly important online for transactional sites and certainly investment decisions like allowable cost per acquisition (CPA) must be taken with future customer purchases and attrition rates considered. The Ansoff’s model is a matrix that can be used to identify alternative growth strategies by looking at present and potential products in current and future markets. 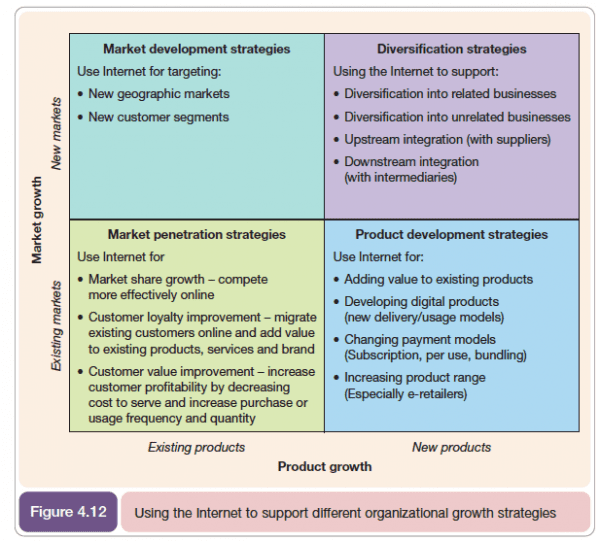 The four growth strategies are market penetration, market development, product development and diversification. Ansoff's model dates back to the 1960s, but I still cover it in the books to show how companies should "think out of the box" with new opportunities for their digital strategies by considering new opportunities for market and product development rather than simply market penetration which misses the opportunities of digital marketing for me. 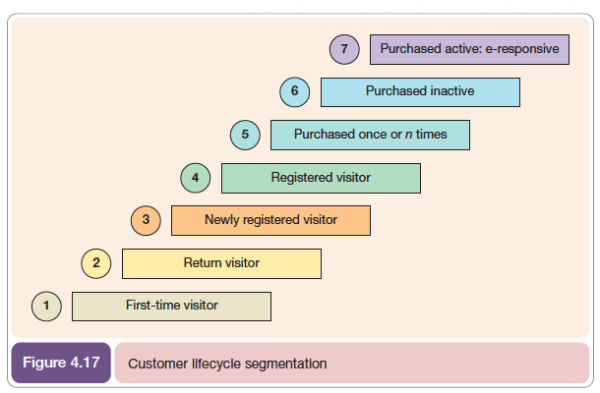 Loyalty models are useful as a way of thinking through the opportunities to generate lifetime value. As an extension of the traditional PEST model, this analysis framework is used to assess the impact of macro-environmental factors on a product or brand - political, economical, social, technological, legal and economic. TBH PESTLE/PEST/DEEPLIST make me groan - to me they're a text book approach which is far removed from improving results. I find students tend to review these in-depth at the expense of creating innovative strategies. The results of the poll seem to suggest others agree. However, PESTLE is still widely taught and Annmarie Hanlon is a fan so to explain it's value to me and others she has this in-depth post on how to use the PEST or PESTLE model. The Five forces in Porter's model are Rivalry, Supplier power, Threat of substitutes, Buyer power and Barriers to entry and are used to analyse the industry context in which the organisation operates. Yes this one features in my books and I reference a classic 2001 paper by Porter on applying the Five Forces to the Internet. But, I personally think it has limited practical value - yes we know customers have more bargaining power online. So what?! I also think it under-represents the power of intermediaries like comparison sites and publishers in the online world. This diffusion innovation model plots the natural path of a product as it moves through the stages of Introduction, Growth, Maturity, Saturation and Decline. 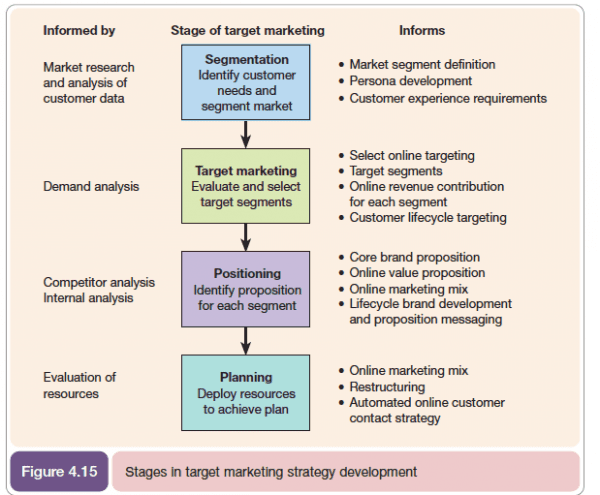 This three stage STP process involves analysing which distinct customer groups exist and which segment the product best suits before implementing the communications strategy tailored for the chosen target group. As a model which is focused on delivering relevant products, services and communications to the customer and so generating value for an organisation, this is essential for every marketer to understand and apply in practice. This acronym stands for Situation, Objectives, Strategy, Tactics, Actions, Control and is a framework used when creating marketing plans. 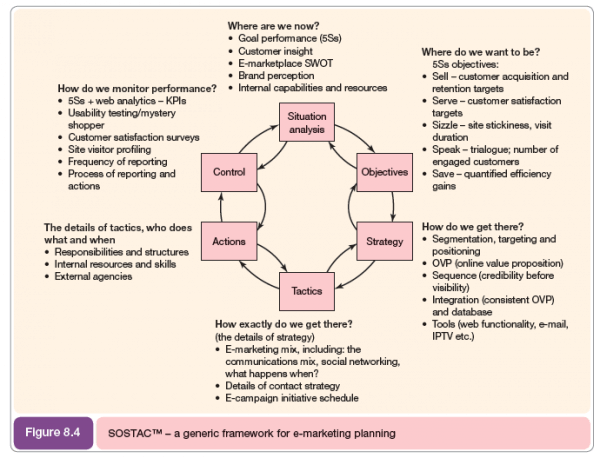 I'm a big fan of using PR Smith's SOSTAC® model as a way of planning and implementing strategies. It features in all my books and I know Paul Smith, who created it well - he's my co-author on Emarketing Excellence. PR Smith (2011) The SOSTAC ® Guide - to writing the perfect plan by PR Smith (2011), published by www.prsmith.org and available at Amazon. Finally, I wanted to thank the Chartered Institute of Marketing who prompted the idea for this post when they were celebrating their centenary and they ran voting around different models. It also prompted the idea for a free guide to help explain the value of models for planning.